Freelite® assays use sheep polyclonal antisera directed against the hidden epitopes of FLC molecules located at the interface between the light and heavy chains of immunoglobulins. Batch-to-batch consistency of Freelite reagents is maintained using a rolling pool of polyclonal antisera. Freelite assays are validated according to protocols set out by the Clinical and Laboratory Standards Institute, including precision, linearity, interference and stability. Figure 5.1. An antibody molecule showing the immunoglobulin heavy and light chain structure, together with free κ and λ FLC epitopes. 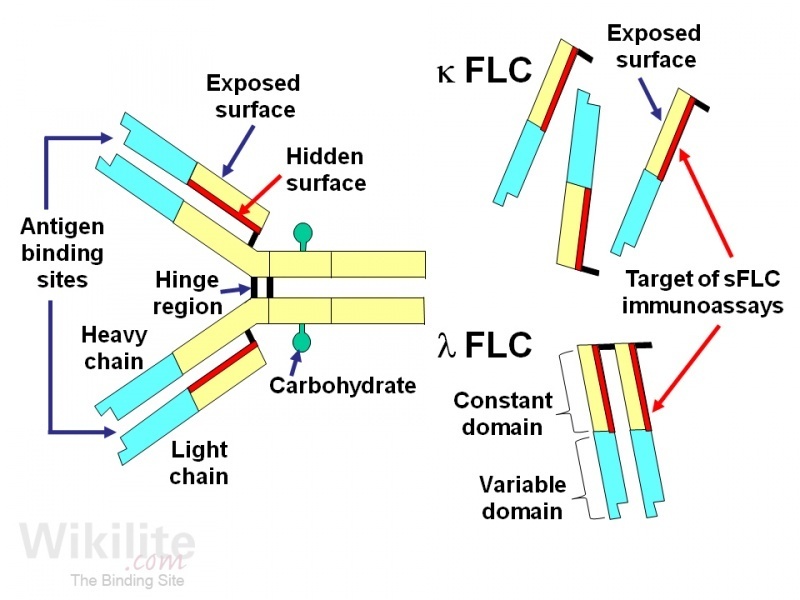 Freelite κ and λ serum free light chain (sFLC) assays use polyclonal antisera directed against the “hidden” epitopes of FLC molecules that are located at the interface between the light and heavy chains of intact immunoglobulins (Figure 5.1). These epitopes are only accessible when light chain molecules are not associated with the immunoglobulin heavy chain. κ and λ FLCs are measured in pairs to produce κ/λ sFLC ratios, or calculate the difference between the involved and uninvolved sFLC concentrations (Section 7.2.2). Polyclonal antibodies raised in sheep provide the most attractive method of recognising the highly polymorphic FLC molecules (Chapter 3). Latex enhancement increases the sensitivity of Freelite assays, to a few mg/L, and the assays are performed by turbidimetry or nephelometry on a number of automated laboratory instruments (Chapter 37).